Can you imagine the joy of that huge crowd as they meet Jesus? The saved are so excited to meet friends and loved ones they have known on earth! The Bible says they will know each other. Yes, we won’t be crippled, or have signs of aging, or false teeth, or any other reminder of sin. Jesus tells us that He is preparing "mansions" for us. 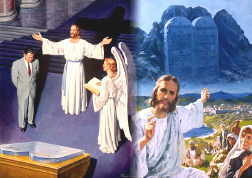 [John 14:1-3] Right now the "New Jerusalem" is in Heaven waiting for us. Just think of arriving in Heaven, and being shown to our "mansion"! There are no locks, no robbers, no fear, no sickness. Everyone trusts everyone else completely. Yes, there may be some people hugging each other as they claim forgiveness from each other. Many good people died before they could have the assurance of forgiveness from others. Many people were unable to personally ask for forgiveness--their relatives or friends had died first. . 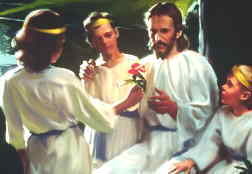 There will be a wonderful time of heart mending and heart bonding. God will spend a lot of time just explaining things. Why did this happen? Why did God let that person die in an accident? We will be able to personally talk with our guardian angel. Our angels can tell us what they were doing "behind the scenes" to save us! Won't it be exiting to hear how they protected us so many times from death! God will open to us the secrets of what He was doing to save and protect His people! But, there is still another work of Judgment to do. Sin is not all ended. The wicked are now dead on earth. Revelation 20 tells us about Satan being ‘chained’ (restricted to this earth). For 1000 years Satan and his angels are still alive on earth. Why another Judgment? 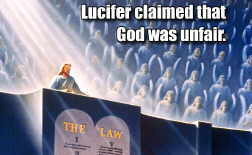 The Bible says that the saved will "judge angels". Think of it this way. If God is going to have to destroy all sin forever, then He will also have to destroy everything that contains sin. There are still people and evil angels on earth that are full of sin. The earth is still full of pollution and the results of man’s approximately 6000 years of sin. Now during the last 1000 years before sin is destroyed, God asks all the ones who are saved to join Him in the final judgment. [Revelation 20:4-8] Yes, everyone will have relatives and friends who are not saved. God must let us take part in that judgment so we see why every person "lost" cannot be saved. The saved all see inside the hearts of the lost with God’s divine moral X-Ray. Every motive, every action is seen for what it really was – good or bad! We will see behind the scenes, just what God, the angels and Holy Spirit were doing to try and save every person who is lost. God's People see why the lost cannot be saved. The lost would not be happy in the perfection of Heaven. God finally has to destroy every trace of sin. Those who chose not to part with sin, must be forever destroyed. In God’s great timetable, the end of the 1000 years of Revelation 20, marks the close of the "Era (time) of Sin". God with the "Saved" -- now form a huge army to go back to earth. There is one battle left. Go to the Next Section: God Ends All Sin and Sinners to read about it.